(CNN) -- Kenya's Christian churches have unified against a proposed new constitution for the east African powerhouse, saying it will offer abortion on demand and give Muslims special rights. Voters in Kenya are due to decide Wednesday whether the new constitution goes through. It's designed to reduce political tensions in a country where the last national vote led to violence that left more than 1,000 people dead. But the wholesale rewriting of the country's constitution has opened up a can of worms, according to the country's Christian churches. "We believe the constitution doesn't meet religious, moral, economic and justice concerns," said Oliver Kisaka, a top official with the National Council of Churches of Kenya. "It privileges one religion over another. It allows abortion on demand. It has strong socialist tendencies," he said, also objecting to the provision for international law to take precedence over Kenyan law. Kenya's Catholic bishops put it more bluntly, putting out a full-color leaflet with a red traffic light over the words "Stop!!! Think.... Choose life." The Anglicans issued a measured statement, but the message was equally clear: "We say NO to the proposed constitution as it is" unless it's amended to answer their concerns about "justice and equality for all religions, the limitation of fundamental rights based on religion, the protection of the right to life and the supremacy of our constitution in the light of International conventions and treaties." The draft constitution defines life as beginning as conception and outlaws abortion, but includes exceptions for "emergency treatment, or the life or health of the mother is in danger, or if permitted by any other written law." Opposition from the churches in Kenya is potentially a big deal. "Kenya is an overwhelmingly Christian nation," said Greg Smith, of the Pew Forum on Religion & Public Life in Washington, D.C. Some 88 percent of Kenyans identify themselves as Christian, he said. And they're not casual about religion either, he said. "Among Kenyan Christians, 86 percent said religion is very important in their lives," compared to about six in 10 Americans who say that, he said. "About eight in 10 say they attend religious services at least once a week. A similar number say they pray every day," he said. The Pew Forum recently published a huge study of religion in Africa, the result of 25,000 interviews in 19 sub-Saharan countries. "People that we interviewed in Africa tended to express high levels of religious commitment. We see the same high levels of religious commitment among Muslims," Smith said. Kenya is about 7 percent Muslim, according to the Pew Forum. Many Christians in Kenya object to the enshrining of Islamic courts as part of the country's legal system. Known as kadhi courts, they would be an alternative to the civil courts "for matters such as law relating to personal status, marriage, divorce or inheritance in proceedings in which all the parties profess the Muslim religion and submit to the jurisdiction of the Kadhi's courts," according to the draft constitution. Close to 40 countries use the kadhi court system, said Prof. Abdullahi Ahmed An-Na'im of Emory University. Kadhi is Arabic for "judge," he explained. If they become law in Kenya, Muslims will use them even if they would prefer to go to civil courts, he predicted. "In Kenya according to the proposal they do have a choice, but in reality it's not going to happen because of social pressure and stigma," he said. "If kadhi courts are available, Muslims will feel compelled to go to them no matter what they want." About 50 countries have some provision for religious courts to act as an alternative to civil courts for matters of personal status, the Pew Forum says. Most polls suggest that Kenya's constitution will pass, but political analysts believe that either outcome is possible. 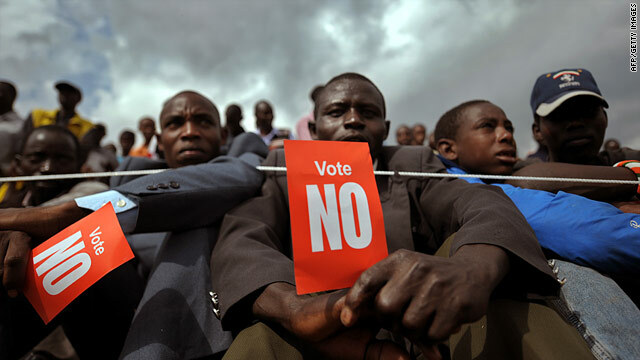 Many of those supporting a "yes" vote -- which includes most of Kenya's political leadership -- are looking not just for a win, but a win by a large margin, so they can have a strong mandate to move forward with reforms. A win by just a small margin could provide the "no" camp with a moral victory, allowing it to stall implementation of the constitution. CNN's David McKenzie in Nairobi, Kenya, contributed to this report.